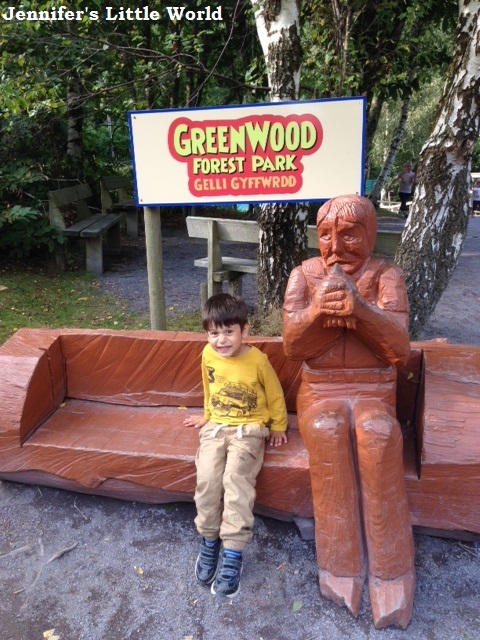 On our recent holiday to Snowdonia we spent a fantastic day at Greenwood Forest Park. The park is located on the edge of Snowdonia National Park and was an easy trip from our base near Caernarfon. It is set in 17 acres of woodland, and has an excellent mix of attractions and activities for the whole family. We arrived as the park opened, and headed first for the Green Dragon Rollercoaster. It's a speedy ride, and is the world's only people powered rollercoaster. Before riding you board a lift which is carried down by the weight of the people in it and used to raise the rollercoaster carriage up to the top of the track. Then you climb up again to board the carriage, and the weight of the riders pushes the carriage along and down the track at quite a pace. Mia was just too small for the ride, but there was a sandpit close by which kept her busy while we took turns to ride with Harry. 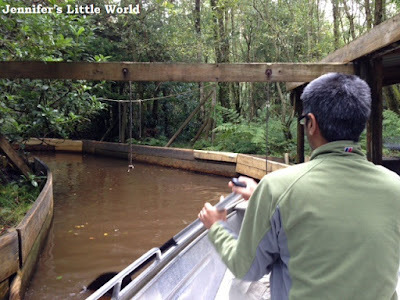 Another human powered ride is the Jungle Boats ride. You (by which I mean the adults in the party, the younger children can sit back and enjoy!) need to move the boat along the river by yourself, either by paddling or by hauling yourself along on hanging ropes. What a great idea! 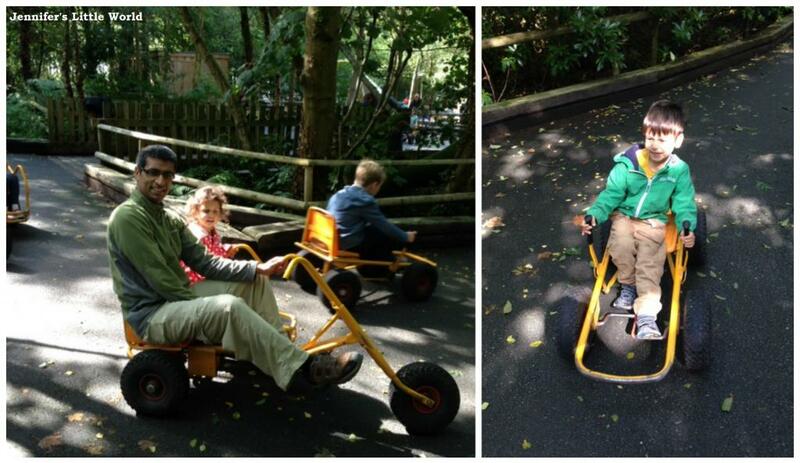 We also expended plenty of energy on the MoonKarts, where you can pedal around a short, partially uphill track. Older children can power their own kart, and younger children can be driven around by a parent. I was really impressed with the Little Forest PlayBarn. Although at three, Mia was at the top of the age range for this area, she was still entertained here for some time while Harry was trying out the Archery. 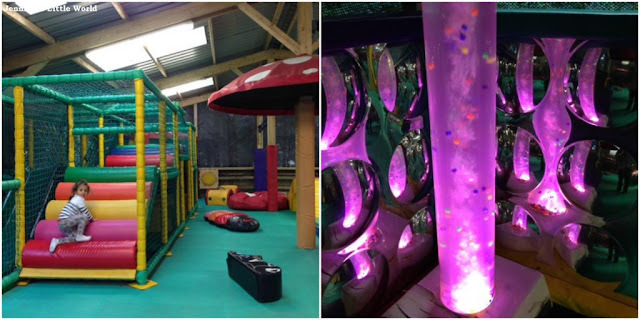 It was really nice to see that there were activities here to occupy younger toddlers and even babies, with a separate sensory area and an area with musical and animal noise buttons to press. I drew the short straw when it came to the Barefoot Walk. I wasn't keen, but the children were desperate to do it and Ram wouldn't, so we took off our shoes, rolled up our trousers, and waded into the icy water that began the walk. Among other things we walked across paths made of stones, fossils, mud, straw and chippings, most of them freezing cold. The children enjoyed it very much, but I must admit that I was relieved to wash my feet and put my warm socks and shoes back on at the end! It was definitely good to try something different though. A massive hit with the children was the Giant Jumper, a huge inflatable pillow for under 12s to jump about on. 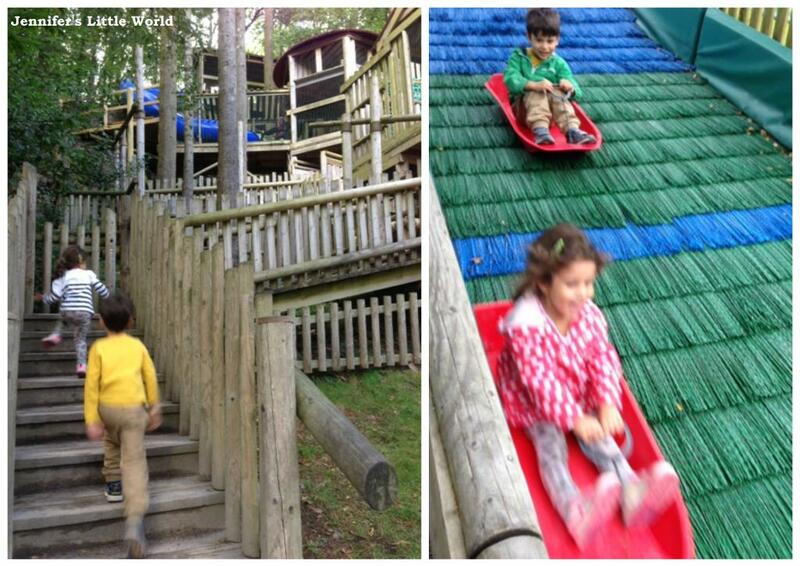 It took the children a while to work out how to climb up it, but once on it they didn't want to come off! It was getting busy so the operator was running timed sessions, but the queue was small enough that they could head round to the back of the queue and get in again straightaway with the next group. Another huge hit was the Great Green Run, a 70 metre sledge run, and the longest in North Wales. You ride it in a sledge, and you really do speed along. We all loved this, although I have no pictures because we were all riding it together! 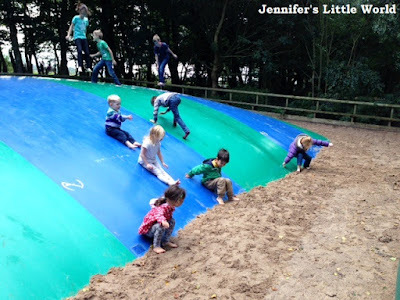 The children also liked the Little Green Run, a smaller version which they could go round and round by themselves, there was never really much of a wait. 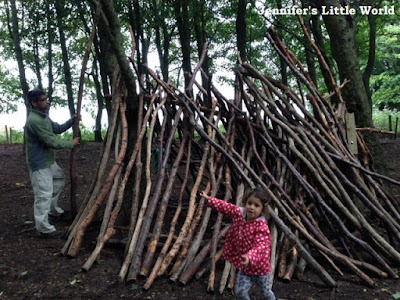 There are lots of outdoor play areas for children of all ages. 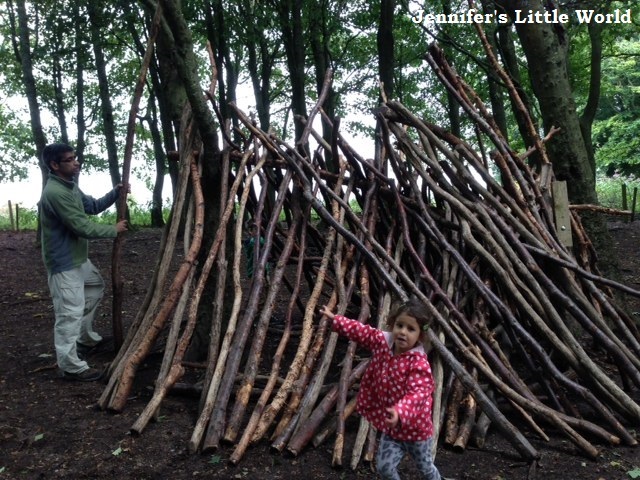 We also enjoyed a wild area at the top of the park where you could have a go at Den Building, with all the materials that you need ready to build with, and plenty of dens left behind by other visitors that you could play in and rebuild to your own design. On the top of the hill at the Snowdon View Point you have a magnificient view across Snowdonia with a clear view of Snowdon. We also enjoyed two of the shows in the Forest Theatre - Howard the Magician and Ricardo the Pirate (each were doing two shows on the day that we visited). There was plenty of seating in the mostly covered theatre, both shows were excellent, and the children were enthralled. Harry was really inspired by the magic tricks that he saw, he told us in the car on the way home that he wants to be a magician when he grows up, and before bed we were treated to his own magic show that he had put together himself! A ticket to Greenwood Forest Park includes the vast majority of the activities in the park, but there are a few which cost extra. 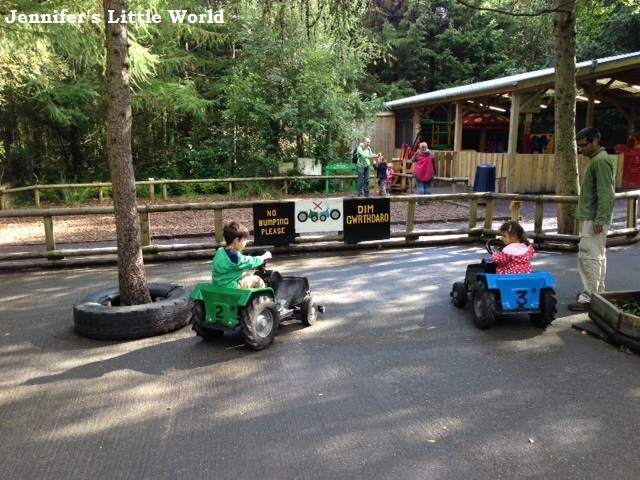 We paid £1 for the children to drive tractors around for a few minutes which they loved. You could quite easily manage without paying for any of the extra activities though. There was so much to do at the park. We were there from opening until all the attractions had closed, and we could easily have stayed for longer. If you are local it's definitely worth thinking about a season ticket! We visited on a sunny August day in the summer holidays and we did have to queue for a few minutes at some of the attractions, particularly during the early afternoon, but nothing close to the sort of queues that you would experience at a larger theme park. For a full family day out, I think that the entrance price represents excellent value for money, especially when compared to other attractions in the area. You can easily spend a whole day here as a family and not get bored. It is worth aiming to visit on a dry day if you can, as although there are indoor play areas and activities a great deal of the park is outside. We had a brilliant day! We received a complimentary family pass to Greenwood Forest Park in exchange for this review. Admission prices vary seasonally, in peak season a family ticket (two adults and two children) costs £42.20.